Bulls head to the United Center after their season opener loss. They were the kids featured all over ESPN and the NBA station earlier this week after their openers, this potentially historic rookie class, the 76ers Ben Simmons with 18 points, Dallas’ fabulous Dennis Smith with 16, the Kings elusive De’Aaron Fox with 14, Phoenix’ Josh Jackson and Boston’s Jayson Tatum, the can’t prospects going three and four, with 11 each, No. 1 pick Markelle Fultz with 10. Move over guys; here comes the Fabulous Fin, the Bulls’ Lauri Markkanen. 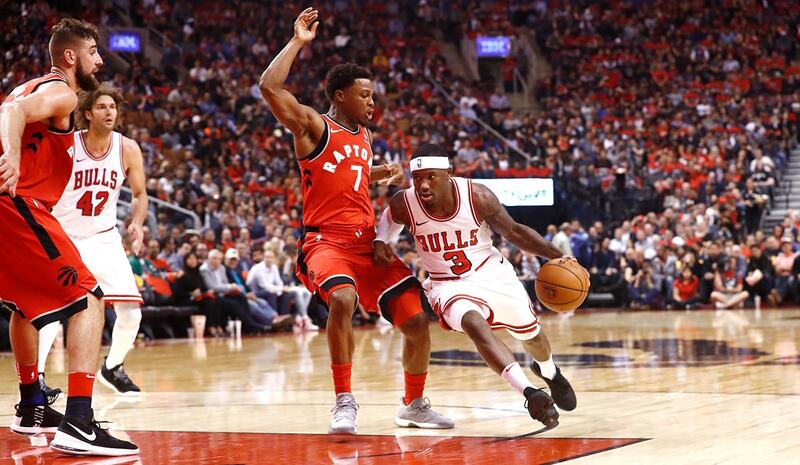 The Bulls weren’t, though mostly because of a catastrophic second quarter when the Raptors opened with a 22-2 run and the game was effectively over with Toronto leading 58-37 at halftime. The team the Bulls recently dominated with 11 straight wins now has won two straight over the Bulls, who suddenly cannot beat the Rap. 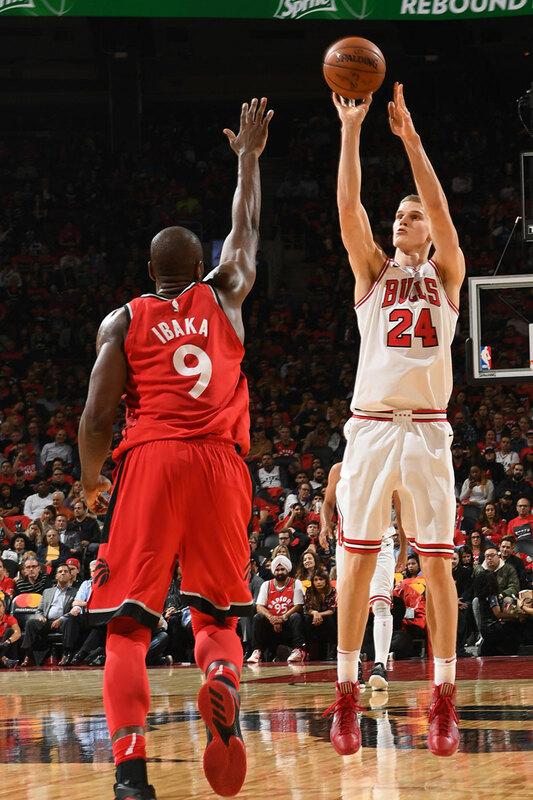 The Bulls, led by Robin Lopez with 18 points, actually outscored Toronto 64-59 in the second half thanks to Markkanen’s 14 second half points. It still was a 20-point Toronto lead after the third quarter on a quiet night for their stars, DeMar DeRozan and Kyle Lowry with a combined 23 points. Bruising Toronto center Jonas Valanciunas had 23 points and 15 rebounds, eight offensive. New acquisition C.J. Miles had 22 points off the bench for Toronto on six of nine threes. The Bulls 19 turnovers led to a ghastly 27 Raptors points. 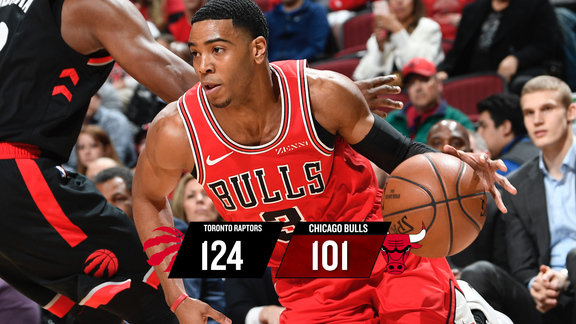 The Bulls against a playing-it-out Toronto team only got as close as 15 points despite scoring 37 points in the fourth quarter. They never could overcome those first five minutes of the second quarter when a 25-23 first quarter deficit became 47-25 Toronto dinosaur stomp. 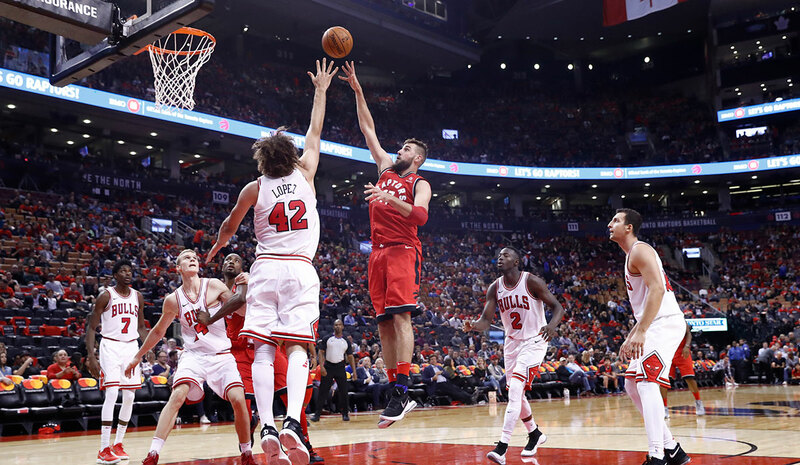 The Raptors pushed their lead to 55-28 a few minutes later before the Bulls settled back to their regulars and, at least, kept the game from being ridiculously uncompetitive like the Suns’ 48-point home night opening loss Wednesday. Vital Bulls backcourt starters Kris Dunn and Zach LaVine, both on the trip to Canada, remain out injured. But the practice altercation that resulted in injury for Nikola Mirotic and suspension for Bobby Portis scrambled the rotation without much chance to experiment. So after a competitive first quarter with the starters led by Holiday with eight points and Lopez with six, the Bulls went with a group never used together before, Ryan Arcidiacono, David Nwaba, Denzel Valentine, Quincy Pondexter and Cristiano Felicio. They were attacked by the Raptors guards, became flummoxed and fumbled away the ball and the game. 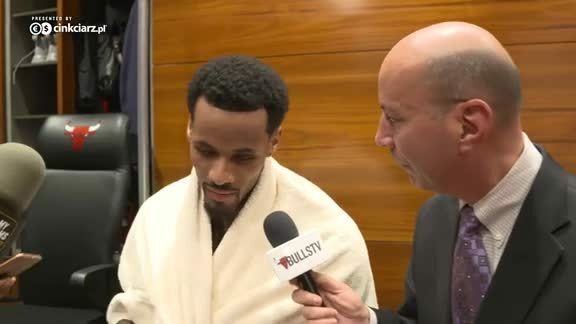 “That was the key stretch of the game, the beginning of the second quarter,” Hoiberg agreed. “They got downhill, picked us up, pressed us; we turned the ball over. We didn’t respond well to that. Obviously, something we talk about a lot is playing through the adversity, playing through the tough times. I was proud of the guys in the second half for coming back. I think we had three chances to cut the thing to 12. I thought (Kay) Felder gave us a big lift off the bench with pace and speed; he sure looks like a guy who is going to be able to get downhill, get into the paint and if we run with him should be fun for our guys. That comes with the home opener Saturday against the San Antonio Spurs. For now, it’s probably going to be more about the specks of sunlight piercing the gloom of the early season injuries and confrontation. Recent waiver acquisition Felder with a career best six assists in 15 minutes was one and appeared to already push aside Archidiacono for those backup point guard minutes behind Jerian Grant, who had seven points and seven assists. Felder shot just two of nine, but getting off nine shots in 15 minutes also showed the sort of aggression Hoiberg was seeking. He’s little at generously 5-9, but appears to have no difficulty seeing the basket. Perhaps Hoiberg also will take a look at Antonio Blakeney, who made his only shot, a three in mop up minutes. Justin Holiday had 15 points and was four of 12 on threes, the Bulls 11 for 33 overall. Denzel Valentine added 12 points as the sixth man with four of seven threes. But for this game, the morning after was the debut of Markkanen, the No. 7 overall pick from the Jimmy Butler trade drafted into the surprising starting power forward position with Portis and Mirotic falling out with their falling out confrontation in practice Tuesday. Portis wasn’t with the team in serving the first of an eight-game suspension. Mirotic was reportedly seeking more opinions regarding his medical treatment. The subject didn’t come up much as the players moved on to the business of the season. So Markkanen suddenly was a starter, which was exciting for his native Finland, for sure. There was a TV crew there asking Bulls players if they thought Markkanen was on the way to being an NBA superstar. The Bulls can only hope. It was a sputtering start for the seven foot marksman, one of four for three points in the first half. Markkanen always says he doesn’t lack confidence and seems to have a knack for quickly putting poor shooting games or sequences behind him and not hesitating. He had atrocious shooting games both in Summer League and in the preseason and came back the next game each time to shoot exceptionally well. And so it was Thursday, tipping in and retrieving his own misses, getting to the free throw line, challenging on defense. He’s a lot more active than anticipated if hardly loquacious. It’s as if he studied how to exchange with media by watching the “know your clichés” scene from the Bull Durham movie. Markkanan smiles when he answers and is welcoming. But he is curt in his responses, wasting little time. Sort of a flick, like with the shot. Did you have any nerves in your first game? What did you do out there that you felt made the difference for that big third quarter? What did you do to prepare before the game? What did you do after the slow start to get going after halftime? Anything different in your routine getting the surprise start? What is it about you that enables you to respond so quickly to poor efforts? Fred Hoiberg said he wants you to hunt shots because you are such a good shooter. What’s your reaction to hearing that? Hey, is Holiday out of the shower yet? You can’t fault Markkanen because he is another of those sophisticated, even for a 20-year-old, international players who speaks several languages. Which is not something you’ll find with many 20-year-old Americans. Or elderly journalists. So we’ll excuse his lack of elaboration. The Bulls love the way he seems to be speaking so eloquently on the basketball court. The Bulls will take whatever ones they get in this season.